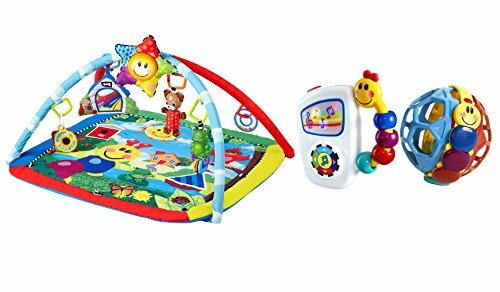 This soft activity gym grows with baby and features dancing lights, classic melodies and 6 activities for baby to discover! For tummy time play, the mat features real-life imagery to introduce baby to the world. The star-shaped electronic toy also fits most cribs and carriers so baby can take lights and melodies on the go! Promote music appreciation and auditory development by introducing your little one to baby-friendly versions of classical masterpieces by Mozart, Vivaldi, Chopin and Rossini with the Take Along Tunes. A large, easy to press button allows your baby to toggle through 7 high quality and enjoyable classical melodies at home, or for on-the-go fun. This baby's version of an MP3 player has colorful lights that dance across the screen to enhance each entertaining melody and promote visual perception. The Bendy Ball features bright primary colors and the recognizable Caterpillar character on center band. Soft, flexible plastic make this ball both durable and fun and the Bendy Ball's design makes it easy for little fingers to grasp and roll. The multi-colored rolling Rattle Ball inside adds additional sounds and visual stimulation to this toy.